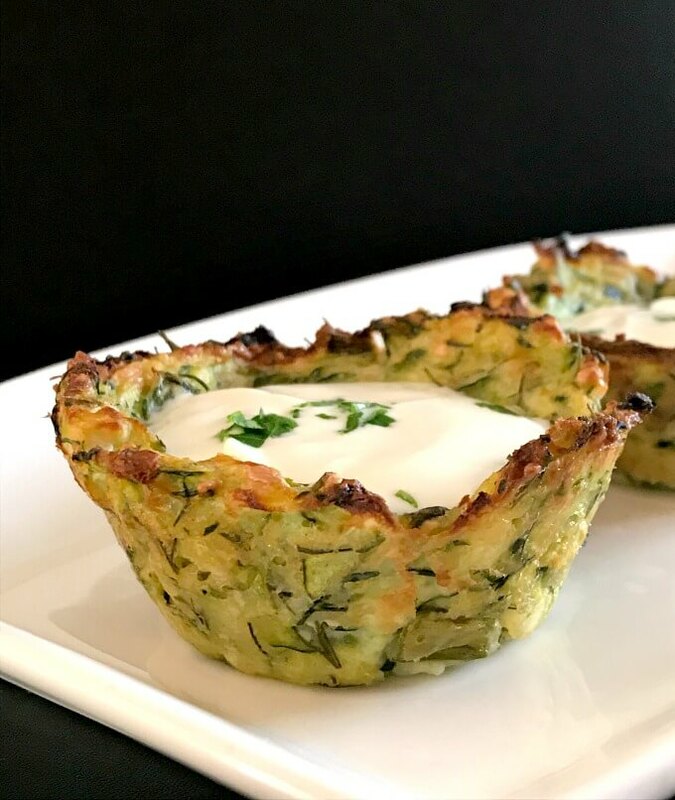 Baked Zucchini Bites with Feta Cheese in a muffin tin, a fantastic low-calorie, low carb, and low fat appetizer for the grilling season. 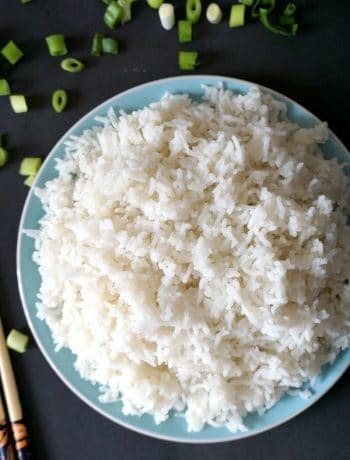 Healthy, super yummy, best served cold with a nice dollop of sour cream or Greek yogurt. Hands up those of you who like zucchini! Or courgettes, what they are called in the UK. Now, they are probably different types of zucchini, the ones we have in Romania are a lot bigger and longer than the ones you find in the UK. Not quite sure if over here those would be called differently. But one thing is sure, everybody all over the world is crazy about zucchini. 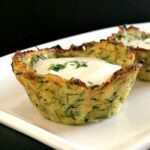 I get it why, they are so versatile, and go well in so many dishes, from stews, to soups, and all sorts of appetizers, with the zucchini fritters being the big crave. Well, these zucchini bites are supposed to be zucchini fritters at first, but then I though I might as well try something I bit different this time. I made the fritters before, and while I love how quickly they are made in the pan, these baked ones don’t take too much longer either. And like my Baked Broccoli Bites, they just taste fabulous, without being drenched in oil. The healthier, the better, isn’t it? These baked zucchini bites have only 40 calories per serving!!! Do you need paper cases for the muffin tin? The amount of things you can bake in the good old muffin tin!!! From fritters, mini omelettes, all sorts of pies, muffins, cupcakes, and the list is never ending. One thing I learnt over the years is that with most of the baked goodies, it is best to just oil the tin well and maybe dust a bit of flour, without bothering with paper cases. Depending what you make, most things end up getting terribly stuck on the paper, but if you just oil it, they can easily come out straight away. How do you make the baked zucchini bites or zucchini fritters? Firstly, grate the zucchini with their skin on, there is no need whatsoever to remove it. One first tip here is to make sure you squeeze as much liquid as you can from the grated zucchini. Add a bit of salt to them, toss them around, then set aside for about 20 minutes so that they can release as much liquid as possible. You can then either put everything in a clean cloth, or just use your hands to squeeze very well. If you don’t use feta cheese, you can choose any other hard cheese, but make sure it’s not soft, as the texture of the bites will change. Now, unlike a patty, the texture of a fritter is on the softer side anyway, they hold their shape very well even if you make them in the pan. In the oven, since they go in the muffin tin, it does not matter if they texture is softer anyway. How long do you bake the zucchini bites for? I baked them for about 30 minutes at 200 degrees Celsius (390 Fahrenheit), they get a nice crispy edge, while the rest get a nice light golden colour. Even if the centre is not that golden, they will be baked after that time in the oven, so not to worry about that. 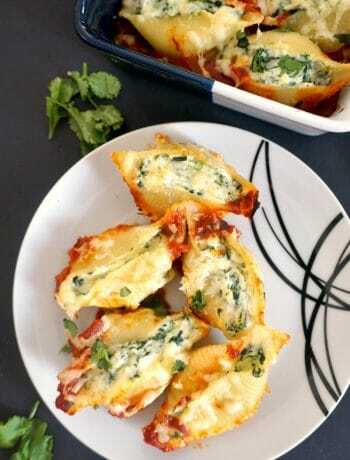 Fill them cups with a dollop of yogurt or sour cream, and top with chopped parsley or dill. 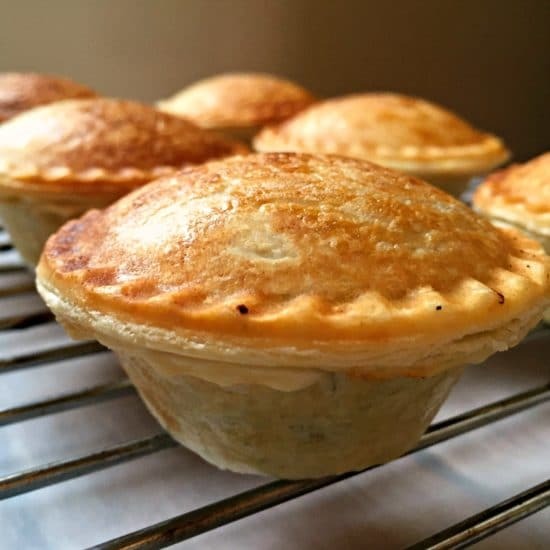 Kids will absolutely love these bites, and they can make a great addition to any summer party, or any time of the year really, since zucchini can be found in the shops all year around. 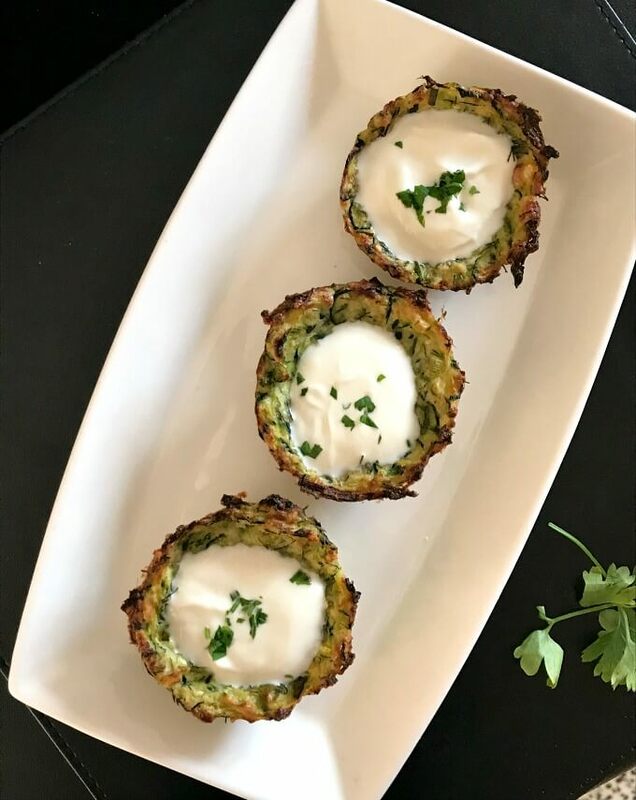 If you’ve liked my BAKED ZUCCHINI BITES or any other recipe on the blog then don’t forget to rate the recipe and let me know how you got on in the comments below, I love hearing from you! You can also FOLLOW ME on FACEBOOK, and PINTEREST to see more delicious food and what I’m getting up to. 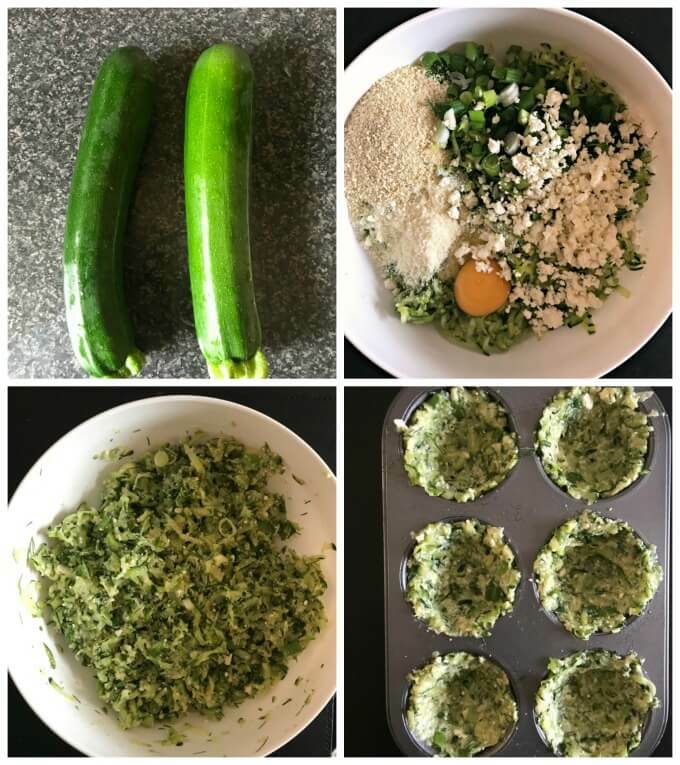 Baked Zucchini Bites with Feta and Parmesan Cheese made in a muffin tin, a fantastic appetizer for the grilling season. Healthy, super yummy, best served cold with a nice dollop of sour cream or Greek yogurt. Grate the zucchini with their skin on, then add a pinch of salt, toss well, and set aside for 20 minutes to release as much liquid as possible. Squeeze the liquid very well using your hands, then transfer the grated zucchini to a bowl, and add the other ingredients. Oil a muffin tin, then shape 10 patties and place them in each muffin hole, making sure the patties cover the tin walls as well. Bake for about 30 minutes, until the edges are crisp, and golden. Use a sharp knife to remove them from the muffin tin. Serve cold with a dollop of sour cream or Greek yogurt.